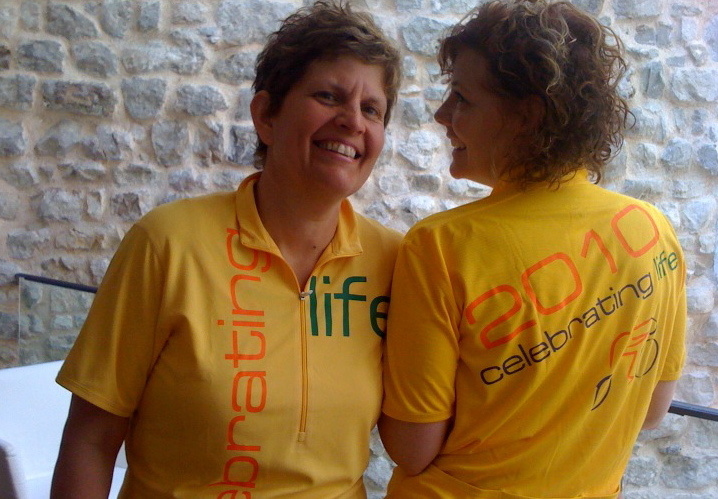 January 2011 - An Opportunity to Celebrate Life! I live in a community where there is lots of talk about oneness and unity. Often, I feel at odds listening to the discussions because there has been a quality to the conversation that I interpret as a transcending of the human experience to a higher order, which I don’t agree with. However, when some Haven friends presented me with the Relationship Equation: 1 x 1=1, I had an “ah ha” moment! Let’s just review some basic math: 1 x 1=1, and 0.5 x 1=0.5, and 0.5 x 0.5=0.25. By applying this equation to any relationship, you can see that if I show up in a relationship as only half of myself, then the outcome, even if the other person fully shows up, is still only 0.5. Not oneness! Worse still, if we both show up only half way then the return is a mere 0.25. This means that if I want to get to oneness, I must bring all of me to the equation: the good, the bad, the ugly and the beautiful! There is no transcending, cutting out parts, bypassing the ugly ego, or really any part of myself. This totally changed my view on oneness. I am all for it now. From a relationship context, this makes complete sense. Sure, I wish only the best of me showed up day-to-day in my interactions with CrisMarie. However, when you live and breath, travel and work side-by-side all of the time, that is just not real. We have amazing moments of closeness, and we have horrible clashes. We also have lots of boring day-to-day experiences. This is life. It’s easy to disengage or try to hide parts of myself that show up at the wrong moment. However, if I go back to the math, I understand that when I take a part of me out of the equation, I miss the opportunity to experience oneness. I listen to people trying to shed parts of themselves. I am sure we have all tried to stop crying or wish we could rid ourselves of rage, pain, sorrow, or hate. It doesn’t work. Somehow, if we want to be one or whole, we have to feel everything deeply, and then and only then, do we get to know fully who we are and maybe get better at choosing how we show up. This same equation applies to teams, groups, families, even countries. 1 x 1 x 1 x 1 x 1=1. There is no other way to get to oneness. My imagining that I could do more, say like 1.5, does not help anyone else I am in a relationship with get to oneness. 1.5 x 0.5=0.75. Wow! The math makes it clear. Each of us can only work on showing up fully ourselves. That is the only way to ONE! If oneness is our destiny, as some have said, then it means our path on this planet is to embrace everything, the good the bad, the ugly and the beautiful. Then, and only then, do we have a chance to experience wholeness, unity or oneness together. So what do we do about the pain, the suffering, the meanness and the cruelty that exists in the world, and within ourselves? First, we don’t deny it; We embrace it; We own it; We show up fully and invite all of the those standing there with us to show up fully as well. In that moment of intimacy, we may indeed kill each other, however, we may also see God. Does that possibility scare me? Sure. I know I have yet to show up fully moment to moment for very long. But if I do the math – it is the best option. Recently I watched a wonderful TED talk by Brene Brown entitled The Power of Vulnerability. I encourage everyone to watch the short twenty minute talk. I won’t cover the major points, but one segment is worthy of more coverage. Brene provides a definition of blame as a way of discharging pain and hurt. In her video she was suggesting that we might bypass blaming if we understand that blaming is simply a way to avoid feeling pain. Personally, I took this another way. As I understand it, there is often an energetic need to discharge pain and hurt, and if this is true, then I can search for effective ways of creating the space for that to occur. As an example, I have had to deal with some experiences in my past that were quite painful. As someone who experienced physical and sexual violence, I found myself angry and unable to move beyond those memories. It wasn’t until I arrived at The Haven that I discovered a path for fully embracing and expressing my blame and discharging that fixated energy within a circle of people who held the space, a place where I discovered that discharging was important because, energetically, I was carrying that story in my cells. Once I had the opportunity to release the charge, I no longer needed to keep holding that story. The circle of people provided an easy path of moving out of being a victim. As others witnessed my pain and hurt, and then invited me to connect by making eye contact and listening to the impact my sharing may have had on others, I was able to be fully in my feelings of pain and hurt, discharging the fixated energy. I did not need anyone to fix it, change or remove the experience. All that I wanted was a space to allow the feelings to be expressed and move through the blame. Being fully in my blame felt made me feel vulnerable and raw. Yet when I looked around the room, I knew I was not alone—in my pain or my blame. We are human. We try so hard to avoid many deep feelings. We even try hard not to blame or be seen as a victim. Part of being vulnerable is revealing our desire to blame, even if that is not the best solution. It is very special when others makes a space for that to be okay, giving us permission to go further, allowing deeper feelings to be expressed. That space opens us up and allows all the other feelings to surface. I am always moved when people ask for a space to scream, wail, fight and discharge the pain of being human. I am quite open to making that space and being a witness to the human experience. I greatly value those in my life who have done the same for me. I have learned it is not about fixing our human experience—that is the work of heroes and gods. The greatest gift is simply being fully present, accepting the human experience, knowing we are not alone. That is the path I have found moves me beyond blame. The new year is already flying by. I thought I’d write another blog by wrapping up 2010 with my version of a Top Ten. It seems like every blogger has some type of Top Ten list and I thought it might be fun to share some of my favorite things from 2010, before 2011 is too far along. 1. Best Gadget: The iPad. I know everyone is talking about iPad2 now, and of course I understand that the iPad2 will be better then the original. However, I have no regrets. I have loved having the iPad! I carry it everywhere and find new uses for it all the time. 2. Best Song: Kingdom Come by DynoJamz. Take a listen. I may never have heard of this song were it not for my nephew, Clarke Reid, who composed the music. The band is an interesting blend of rap, brass, and piano. This is the preview track from their new album. 3. Best Movie: The Social Network. I haven’t really been a Facebook person, however, I love the director Aaron Sorkin and quite enjoyed the movie. Plus, I came home and got myself back online and have been enjoying a bit more Facebook. 4. Best Novel: Half Broke Horses by Jeanette Walls. I loved this book, couldn’t put it down. It’s the story of a resilient woman with and a very strong character. I highly recommend it. 5. Best Nonfiction: Cooking Up Good Vibrations. Check it out! This is the best gluten-free cookbook! Even I can follow the recipes. Plus, I know the folks who put it together and think everyone should have a copy. 6. Best Place to Eat: The Green Tea House in Whitefish, MT. I eat there almost everyday for lunch. I love the food and enjoy just hanging out. If you’re ever in Whitefish, try it. 7. Best iPad App: Pulse. I like this application because I can get tons of information, everything from news feeds to Facebook updates, on one page. I like being able to put in a topic and quickly pull lots of information from the web to review. 8. Best TV Show: Modern Family. I have enjoyed every episode and laughed out loud at least a few times during each show. The characters are great and the script smart – love that! 9. Best Play: Colin Quinn: Long Story Short. Normally this would be a local selection but this year I was in New York for a series of great shows, so CrisMarie’s appearance in Dividing The Estate, though seen the most, did not make the top of the chart. Colin Quinn: Long Story Short was a surprise hit for me. It’s the performance of one guy for 75 minutes. I just didn’t think it could beat out musicals. But we talked about it for days and we’re still bring up some of the best lines. It was an awesome show. 10. Best Gift: Celebrating Life Bike Shirts. Renee and Jim totally surprised me with awesome bike shirts for all four of us (CrisMarie, Jim, Renee and I) to wear while on our bike tour in Croatia! Renee is a master of surprise. At the beginning of the trip, and she and Jim pulled out the shirts wrapped with a ribbon and a colorful bike bell—it was perfect! Okay, so this is my take on a random list of things that delighted my year. 2011 is already offering some new delights but you will have to wait for those. I plan to get back to more regular postings now that the year is launched.